Astronauts soon will have new experiments to conduct related to emergency navigation, DNA sequencing and ultra-cold atom research when the research arrives at the International Space Station following the 4:44 a.m. EDT (1:44 a.m. PDT) Monday launch of an Orbital ATK Cygnus spacecraft. 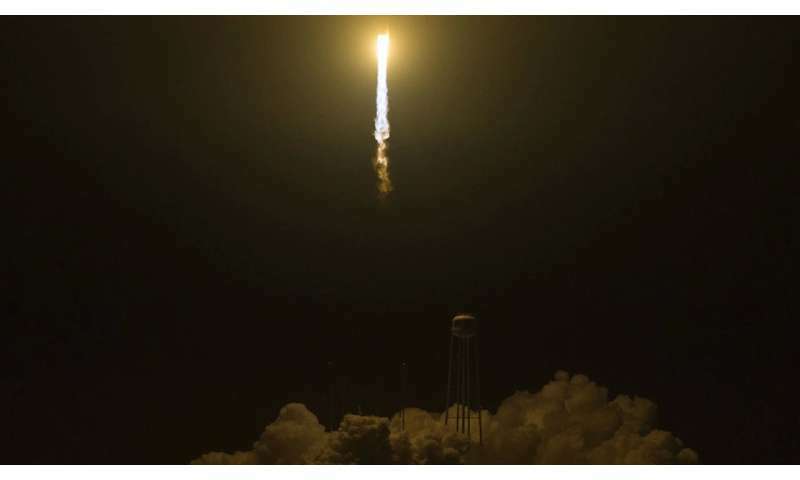 Cygnus lifted off on an Antares 230 rocket from NASA's Wallops Flight Facility in Virginia on Orbital ATK's ninth cargo mission under NASA's Commercial Resupply Services contract. The spacecraft is carrying about 7,400 pounds of research equipment, cargo and supplies that will support dozens of the more than 250 investigations underway on the space station. NASA's Jet Propulsion Laboratory in Pasadena, California, is involved with four items flying aboard the spacecraft: three Earth-observing CubeSats and an experimental physics facility. NASA astronauts Scott Tingle and Ricky Arnold will use the space station's robotic arm to capture Cygnus when it arrives at the space station Thursday, May 24. Live coverage of the rendezvous and capture will air on NASA Television and the agency's website beginning at 3:45 a.m. EDT. Installation coverage is set to begin at 7:30 a.m. In the realm of modern physics, the new Cold Atom Lab (CAL) on Cygnus could help answer some big questions. CAL creates a temperature 10 billion times colder than the vacuum of space, then uses lasers and magnetic forces to slow down atoms until they are almost motionless. In the microgravity environment of the space station, CAL can observe these ultra-cold atoms for much longer than is possible on Earth. Results of this research could lead to a number of improved technologies, including sensors, quantum computers and atomic clocks used in spacecraft navigation. The Cold Atom Laboratory was designed and built at JPL. It is sponsored by the International Space Station Program at NASA's Johnson Space Center in Houston, and the Space Life and Physical Sciences Research and Applications (SLPSRA) Division of NASA's Human Exploration and Operations Mission Directorate at NASA Headquarters in Washington. The Cygnus vehicle also carried three CubeSats that will test new technologies for Earth observations. RainCube—short for "a Radar in a CubeSat"—is a miniaturized precipitation-studying radar instrument, and the first active radar instrument to be flown on a CubeSat; CubeRRT, the CubeSat Radiometer Radio Frequency Interference Technology Validation mission, will test a technology to reduce radio frequency interference (RFI), a growing problem for space-based instruments used to study things like soil moisture, meteorology, climate and other Earth properties; the TEMPEST-D (Temporal Experiment for Storms and Tropical Systems Demonstration) satellite will validate a miniaturized radiometer technology that could make it possible to use fleets of CubeSats to study developing storms, and provide data to the ground over shorter time intervals than what's possible with large, individual satellites.